The kids have finally gone back to school and the weather has naturally turned to being the ideal summer weather. It happens every year. Iffy weather prevents the kids getting into really enjoying the summer holidays and then they go back to school and it is perfect! But to be fair we did have some nice days in January. And so far in February we have had three nice days. 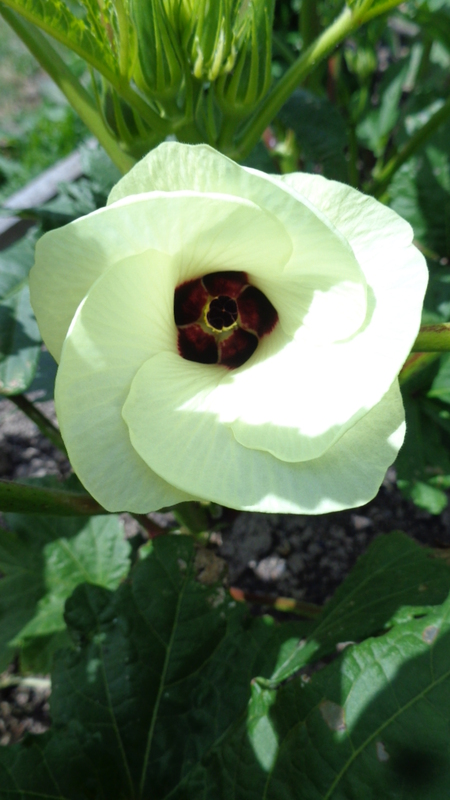 How amazing is this okra flower? So after the busy craziness of January, getting the manuscript ready for the publishers for my second book, I was finally able to focus all my attentions onto the garden without being interrupted by kids wanting or needing something. I think my cucumbers may have succumbed to powdery mildew while I wasn’t looking. They don’t look pretty. So I set about improving the air flow by taking off the older leaves from the zucchinis and anything else that could become inflicted by the dreaded mildew. 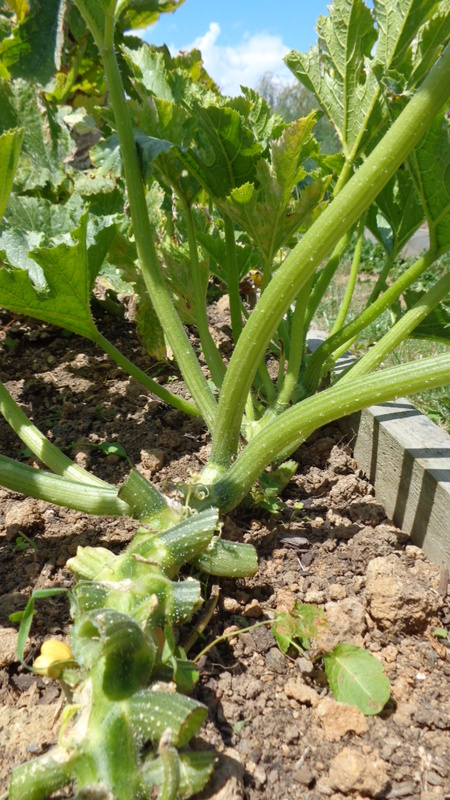 The problem is zucchinis have quite sharp prickles on their leaves and so while I was delving deep into my plants looking for the start of the old, tired leaves – I got a little scratched up. 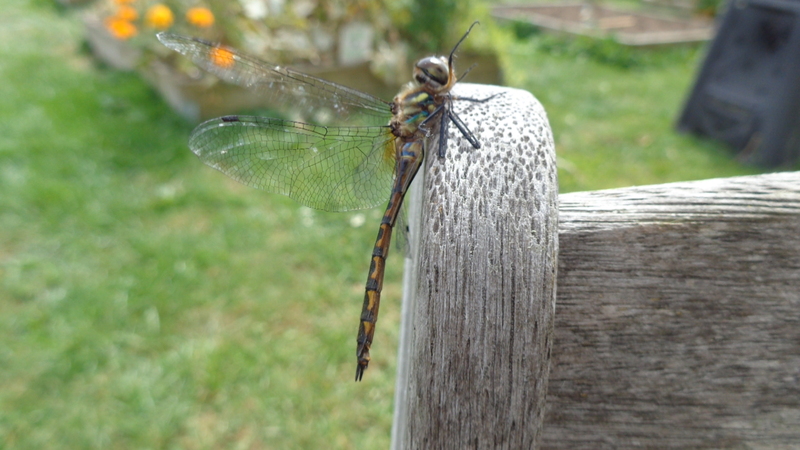 While it is kind of expected to scratch my hands and arms – I certainly didn’t expect to scratch my head! I have scratches on my face! My zucchini can now feel the breeze around their lower regions! Then – as it is summer and all, I was wandering about my garden bare foot, as I normally do, when I stood down quite firmly on a prickle. A juvenile one of those scotch thistles – the ones with the purple flowers. Despite being a baby, it’s thorns are made of the toughest, pointiest, nastiest, hurtiest stuff in the plant world. It really hurt and I ended up limping all day. I’m not sure if there is any prickle remaining in my foot, or if it is just the severity of the puncture wounds that caused the pain. So I slipped on my gumboots, grabbed my loppers and set out on a mission to find and eradicate all trace of thistle from my patch, the lawn, the driveway, under the hedge, in the lambs paddock – apparently it is not something they eat, and in the goats paddock – they don’t eat it either and I thought they eat everything. I rescued this little fella. Somehow he had gotten his back half stuck down between the boards on the deck. I think I got it all, but I was tempted to jump the fence and clear the neighbour’s fields too, but they have electric fences and cows so I just have to hope the winds have been strong enough to blow the fairies right over our place and into the fields beyond. When I was I kid I used to call the fluffy seeds ‘fairies’ and the boy ones still had the seeds attached and the girl ones didn’t – because the boy ones were wearing hats! Some nasty varmint has been stealing my popcorn. So I put a scarecrow on duty and put all of the solar lights around the plants. If this doesn’t work then I will use windmills and windchimes. After that it will be a mouse trap! I think I will need to be extra vigilant for the next wee while as there are been more than normal amounts of these dreadful plants this year. Which will mean a thousand fold increase in seeds swanning about on the breeze deciding where to land and grow that will cause the greatest pain result for unwary, barefooted gardeners like myself! So with the bush crashing through the zucchinis and hunting down offensive thistles, my day was hijacked. I had intended to do a quick check of the garden and then get on with processing a mountain of tomatoes and make relish – which I still haven’t done, and there are more tomatoes ripe on the plants that need picking again. I have onions to pickle and some beetroot that I allowed to get a little too big for any jars I possess. I don’t even want to talk about the beans. Maybe if I ignore them they will go away – especially as we don’t like them all that much. Well… if there are so many then I guess we should eat some! Come again soon – one day very soon there will be a photo of jars and jars of preserved delights. Lol, that made me smile. Have you tried currying the beans? I have recipe somewhere for a four bean curry but I’ve made it with just runners and French beans before and it looks like you have 3 varieties of French bean, so………. HI Elaine. I’d love to try your curry bean recipe. I’m open to anything that will help us to enjoy all these beans. 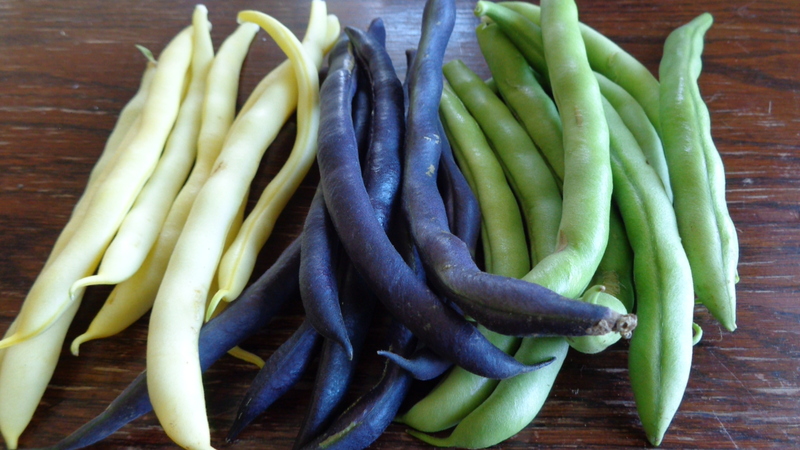 I think the key next year is to grow less, but the bean seeds look so pretty… I can’t seem to help myself. Isn’t it funny how distractions can come on so strongly they hijack our entire day, but we don’t mind so much sometimes? I think you need to find beans recipes that you and the family enjoy. I can’t imagine dinosaurs not liking beans! How about pickling them? You know, dilly beans? Hi there. I did try pickling a couple of jars of beans the other day, but they were in a malt vinegar. I would love to try Dilly beans. Is the recipe widely available on the internet or is it one of your family secrets? Okra flower is amazing but short live. I see it before it open and by the time I come back from work it is already gone. lucky I took few days off to catch them in action 😉 and to catch up with the garden and pickling. have you started winter seedlings yet? Hi Dina. I think I may have to get one of those bean slicers. I remember my mum has one when I was a kid and it was a cool job. Maybe the boys will eat them after preparing them through the slicer! Thanks for the tip. oh, I meant to add this, just in case you don’t have it and you need encouragement 🙂 very useful. Sorry Fran – I missed this comment. Zukes can get blossom end rot too. Possibly because of a lack of calcium. 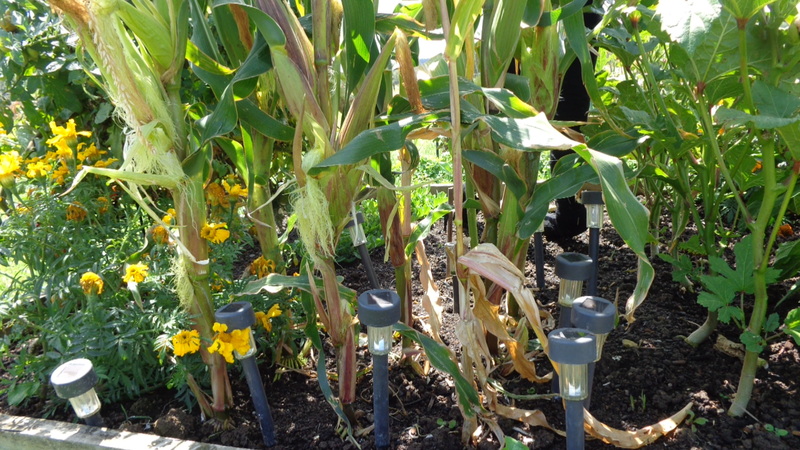 Or it could be poor pollination or uneven watering. The upside is you aren’t suffering from the indignity of being out foxed by the blighters and having them hid their marrows from you! I really must get one and sow more beetroot in my garden for the winter. Procrastination is the biggest pest in my garden. I am convinced the trials of gardening are sent to challenge us. Sarah I have heard you share on Southern Star. Well done! The weather this summer is crazy having all four seasons. Hi Tracy. Thank you for your lovely comment. The weather has been far from ideal this summer, but there is still a harvest and it is also a great opportunity to learn about gardening in this kind of weather so next time I will be prepared. There is always things to learn in the garden. Loved reading the post, sorry that I didn’t get there sooner. Take those beans and fry them in butter, nothing better, though full of calories, so delicious. Hope the thistles are fading. Hi Lucinda. Butter makes everything taste good! Every now and again I stubble across another prickle (with my bare feet) trying to sneak into my garden. But they don’t get far. I love your bustling garden. I’m glad you are finding more time to dedicate to your first love now that the kiddos are back in school. Those tri-colored beans are beautiful. I’ve never made relish. I bow down to your greatness. Hi Alys. I seem to be so busy these days that finding time for the garden has had to be put on a list! But knowing summer isn’t with us for much longer means I have moved it higher up the list and will ensure I get the most out of it before it performs its dying swan song! Relish is easy – it is the bottling and canning that freaks me out! I’ve never done either, but it sure sounds like a big process. I didn’t know you could freeze tomatoes before reading your blog. I had so many at the end of the season and couldn’t possible eat them all. I prefer fresh, but I liked having them on hand to use in soup this winter. Thanks for that.